We stacked Mari's first hole with a mix of yellow and rose gold rings. This hole had become "stretched" from years of use. 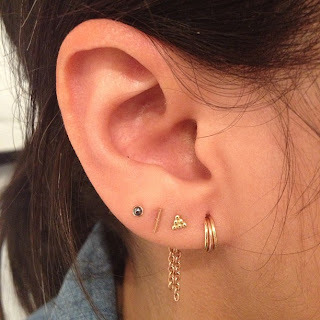 The stack fills the hole and almost gives the illusion of 1 earring. YG 6 ball cluster in her second hole with a rose gold back drop. BRVTVS is responsible for the flat bar in her 3rd hole. Hematite in rose gold setting for her 4th hole. I love using hematite because its dark and neutral, it also is known for its grounding properties. One of my favorite ears to date. Wow! I must say this is something unique and I love this idea of piercing ears. It looks great with these cute tiny sized earrings. I just love your aesthetic...you seem to have a great eye for choosing and mixing pieces and making every ear a work of art. I have to get up to NYC to see you some time. Thank you for this idea! I have a 14g upper lobe that I don't really want to close up, but I don't like having to have the larger diameter rings in. On the search for multiple smaller gold hoops now!